I want to share with you a couple of wine books I’ve read recently, which are not the usual wine reference books, as each involves travelling in wine country, but viewed from very different angles. Both are books you can dip into by sections or read cover to cover and are, arguably, more travel books than wine books. Having worked for a long time in the world of wine and in book publishing, if I find a book that surprises me with new knowledge or a fresh approach, I’m delighted, and reading both these books fitted these criteria. The original inspiration for this book has a sense of the ridiculous about it and frankly, so does the entire book, but it provides an amusing romp through somewhere completely different in the world of wine, North Africa, seen through the eyes of a wine professional. Francis Gimblett has worked in the UK wine trade for over 25 years (as I have), but travelled in different directions. However, one job we’ve both done for several years has been to educate about wine in an entertaining and utterly un-snobbish way; however putting that approach down on paper is not so easy. In describing his journey in search of the best wines of Algeria, Morocco and Tunisia, Gimblett has found an excuse to do just that, in a typically British self-deprecating way. The story relates Gimblett’s journey through the three countries, stopping at the most important wineries, aiming at eventually securing a visit to the wineries part-owned by the French actor and wine producer Gérard Depardieu, whom he fears he slighted in a TV show, where he made a joke about his large nose. This frail excuse for a story inspires Gimblett and his rather long-suffering, but very patient friend Philip on their travels from London through France to Tunisia, back to France and onto Morocco via Spain, all in a mainly trustworthy, sturdy Land Rover. A final section sees Gimblett flying over to the potentially dangerous Algeria to complete the trio of North African wine producing countries – he hadn’t been able to drive through to Algeria because of border problems. Along his journey, Gimblett is often received at wineries with bemusement, especially when he asks to be directed to the nearest campsite (trying to keep the budget down), and he accepts their hospitality graciously when it’s proffered. Frequently, he is served wines and given information by people not allowed to drink alcohol for religious reasons, and has to figure out for himself what makes a particular winery or wine region suitable for wine production. The whole journey is a fascinating read, as Gimblett describes the colourful landscapes and encounters simply, with endearing good humour. In this, his first book, Gimblett styles himself as a Wine Adventurer and it certainly works, in a truly light-hearted manner. There may be more to come. Mixed reviews and a poor and unwieldy title made me somewhat doubtful that I would enjoy this book, but after dipping into a couple of test chapters and then, enthusiastically starting again at the beginning, I reached the end, enjoying each part of his journey. The joy of Taber for a start is that he knows how to write clearly and logically, not surprising when you read the biography of this seasoned long-time financial journalist. What Taber is not, contrary to some opinion I’ve read, is a true wine writer; he’s a wine lover who has turned his writing skills to viewing different aspects of the wine world. Each of his three books about the subject (and I have not yet read the first two) has a focus on one particular aspect of the world of wine. This book, aimed neither at wine neophytes nor at wine connoisseurs, places the focus on wine tourism, but it doesn’t stop Taber from dipping into all different aspects of wine from history to geography and the science of winemaking, often in some detail, but always with clear explanations. There is nothing comprehensive about the choice of wine regions Taber chooses to visit in the course of his six months research, but it does give him and, therefore, his readers, an excellent flavour of wine tourism in Europe and even more so perhaps in all the key New World wine producing countries. In each of the main twelve chapters, corresponding to a different and important wine country, Taber sets the scene for the particular flavour of wine tourism there by discussing either the history of the country, the region, its wines or its general tourism. There are simply told stories of politics, dodgy economies, monks, entrepreneurs, trains and even bungee jumping all of which have some direct relationship with wine tourism in their respective areas. Taber introduces us to a selection of wineries and their owners in each country, discussing their relationship to the wine tourism offering. Each main chapter is followed by a shorter chapter named Diary of a Wine Tourist including a personal account of an experience that Taber had whilst visiting each country and in these Taber writes in a completely different personal voice that nicely breaks up the book. Undoubtedly, for any experienced wine traveller, Taber’s final visit on his journey, to the wine regions of Georgia are the most exciting as so few of us have been there – it’s definitely inspired me. This is certainly no guide book, nor a real travel book, it is simply a good read that might inspire someone with a love of wine (if not a deep knowledge) to travel beyond his or her comfort zone. It also shows that like wine, wine tourism is quite different the world over. Disclosure: I paid for both of the above books! Several of the writers for our website are published authors of books on wine, food or travel. I’m very proud to tell you that two books recently published by our writers have been shortlisted for prestigious awards. Michael Edwards’ beautiful book The Finest Wines of Champagne is on the shortlist for the André Simon Awards (a UK award for food and drink books); Paul Strang’s long awaited, meticulously researched book South West France, the Wines and Winemakers is on the shortlist for a Gourmand World Cookbook Award (international, Paris-based organisation). UPDATE 13th Feb 09: Paul Strang’s book has now been awarded ‘Best Wine Atlas/Wine Tourism Book in the World’ in the Gourmand World Cookbook Awards. You will find all the above books in our new Wine Travel Guides stores for Amazon (USA) and Amazon (UK). By making your Amazon purchases through the stores, we gain a small commission and you support our website. We are not allowed to show Amazon products in the sidebar of a WordPress blog, and affiliate linking in a post is only allowed in a limited way. Thanks and happy reading! 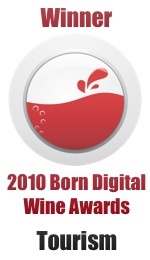 This entry was posted on Tuesday, January 19th, 2010 at 7:52 pm and is filed under Wine Tourism General. You can follow any responses to this entry through the RSS 2.0 feed. Both comments and pings are currently closed.